Imagine sending power wirelessly around a room, as easily as the way in which your mobile phone locks in on a Wi-Fi signal. That’s what Ossia’s Cota wireless power platform promised us at CES—and it’s a pretty amazing vision. To most of us, “wireless power” connotes a solution in which we place a smartphone on a charging pad or surface and walk away. Ossia promises to take that a step further: delivering power via RF frequencies of about one watt up to 10 meters away. Physically, Cota requires two different components: an array of transmitter chips, and receivers which will be built into phones or tablets. Here’s how Cota works: the premise is that every mobile device, such as a phone or tablet, sends out a “beacon” signal in all directions, identifying itself to a wireless or cellular network. More advanced Wi-Fi technologies “know” where the device is, such as a MIMO array of antennas used by some 802.11ac routers, for example. Cota uses the same principle to safely deliver wireless power: it tracks the beacon signal as it bounces off walls and ceilings, then sends the power back on the exact same path. And if the device moves, the power is rerouted. If a particular beacon signal isn’t visible—if it’s blocked by a person, for example—the power won’t be delivered. Howard Mendelsohn, Ossia’s chief financial officer, says that’s the mechanism by which customers can be assured that Cota is safe for general use. Cota uses the 2.8-GHz frequency band to deliver pulsed power at 100 hertz, which shouldn’t interfere with other consumer technologies. 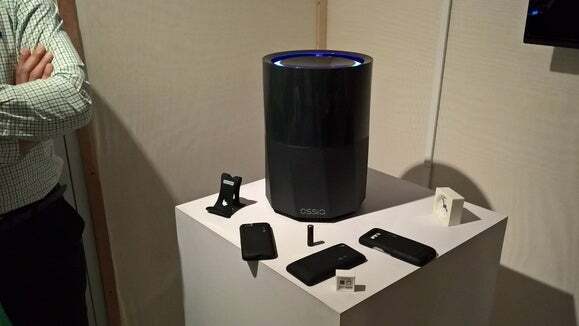 Ossia showed off a number of prototype devices that used the Cota technology, including a small garbage-can-sized cylinder that houses a fan-like array of Cota transmitter chips, Mendelsohn said. The company also showed off a few prototype cases that slipped over iPhones, charging them while being suspended in the air. The company even attached the chip to some rechargeable AA batteries. 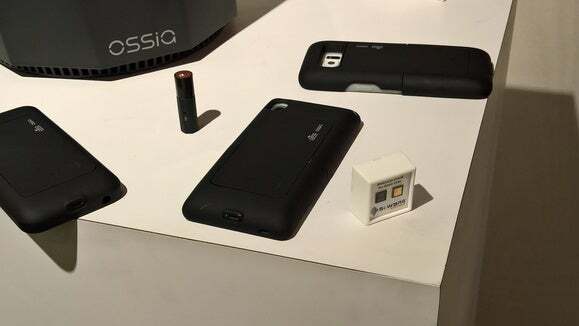 Ossia executives suggested that the Cota wireless power technology could be used to power the Internet of Things, even in a future where wireless power effectively removes the need for batteries. And since the power is pulsed, they said that they could effectively transmit data over the same beam. They even showed off a Web app through which Cota could identify individual devices on the network—and then either prioritize or even bar them from receiving power as a security measure. Naturally, Ossia won’t be able to deliver Cota right away. Executives said that it should enter production near the end of the third quarter, and Mendelsohn said that the receiver chips should enter production at the end of the first quarter. According to Mendelsohn, first-generation Cota products will include accessories, such as iPhone cases. If all goes well, next-generation products will include the Cota chips within them. Case maker XPNDBLS said that it had signed a deal with Cota to include its technology, and Mendelsohn said the company had received investments from Molex and Japanese electronics giant KDDI as proof that it’s on the right track. Cota sounds great on paper, although we’ll have to see how it handles normal use cases: a smartphone tucked in a pocket, for example. But what’s amazing is that what once was science fiction appears to be moving into the realm of reality.